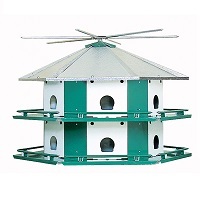 There are a few things you will need to host purple martins in your backyard. 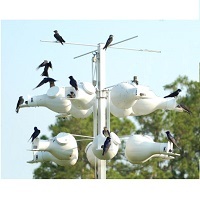 What type of Purple Martin bird houses, purple martin gourds and purple martin pole you select for your birds is vital. It is strongly encouraged to enlarge the compartments to both protect the purple martins from predators and to increase clutch size. There are natural gourds and plastic artificial gourds. 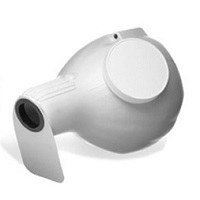 It is recommended that all gourds have access ports for easy cleaning and nest checks. I use both plastic and natural gourds. Statistics show that number of purple martin eggs laid, number of eggs hatched and number of surviving young is greater in gourds vs “houses”. 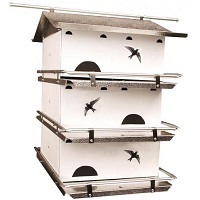 Most plastic housing compartments are 6x6 which is technically sufficient for a purple martin but not ideal. Again, the compartments are easily enlarged to 6x12, but that cuts the amount of rooms on the martin house by half. 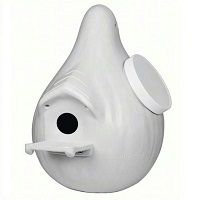 You'll find peoples opinions on plastic purple martin bird houses is quite heated. 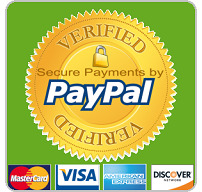 Be forewarned-DIY does not mean less expensive. 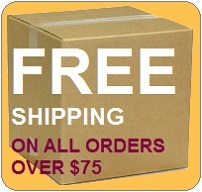 If you do want to make your own purple martin house, check out the free purple martin bird house plans we have found. If you still don’t know what type of housing you want to offer, look at your budget and what appeals to you-esthetically. The pole may well be one of the most over looked and under appreciated ingredients, when it comes to hosting Purple Martins. A good pole can turn a strenuous task into a pleasure. 1. How heavy will your martin housing be? Why is weight an important consideration? Because if you know you want to have a large heavy wooden purple martin house and/or you can't lift heavy objects(bad back?) Then you can cross a telescopic pole right off your list. Conversely, if you choose a smaller aluminum martin house and are able bodied, a telescopic pole may be a budget friendly option for you. PurpleMartinPlace.com features housing systems that combine a great selection of housing options pre-matched with poles to assure the proper combination of strength and value.